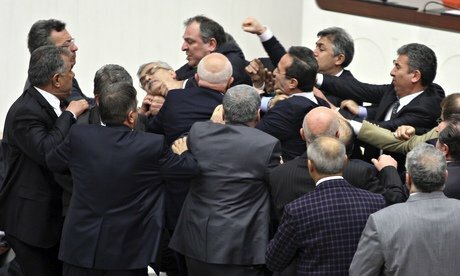 Turkish lawmakers have approved controversial plans to reform the country’s top judicial body, amid a brawl which left one opposition legislator with a broken nose. Turkish government wants the Supreme Board of Judges and Prosecutors – the HSYK – to come under justice ministry control. The bill was debated overnight amid heated scenes, with reports of dozens of lawmakers involved in a fist fight. Last month the judicial body said the plans were unconstitutional and would undermine its independence. The plans were proposed by PM Recep Tayyip Erdogan’s AK Party, which dominates parliament. At one point during the 20-hour debate, scuffles broke out leading to punches being thrown. The lawmaker whose nose was broken – Ali Ihsan Kokturk from the opposition Republican People’s Party (CHP) – needed hospital treatment. Another one from the governing AK Party suffered broken fingers. Ozcan Yeniceri, a lawmaker from the opposition Nationalist Movement Party (MHP), was among those to criticize the bill, saying it was aimed at impeding corruption inquiries and “meeting the needs of the AK Party”, Reuters reports. The reforms come after allies of Recep Tayyip Erdogan were arrested in a major corruption inquiry, after which the government dismissed hundreds of policemen. There is intense rivalry between Recep Tayyip Erdogan and a former ally, Fethullah Gulen, who has many supporters in the police and judiciary. Fethullah Gulen is an influential Islamic scholar living in self-imposed exile in the US. Judicial reform is a highly sensitive issue because Turkey is under pressure from the EU to bring its justice system into line with EU standards. Turkey hopes to join the EU, but progress in the negotiations has been very slow.